8 years ago, Julie Ann Estardo dreamed of being an Accountant. And she pursued her dream when she took up Bachelor of Science in Commerce, Major in Management Accounting at Colegio de San Agustin Bacolod. 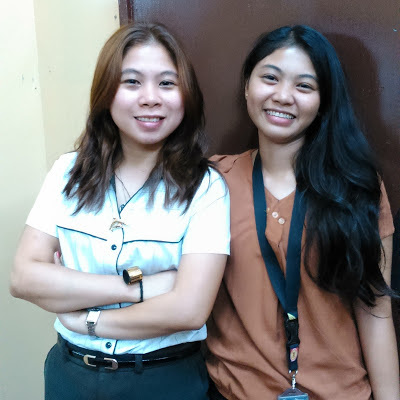 Her dream became a reality when she graduated 2 years ago (2013), passed the board and is now working as the Loan Clerk at Rural Bank, Inc. in Talisay City. 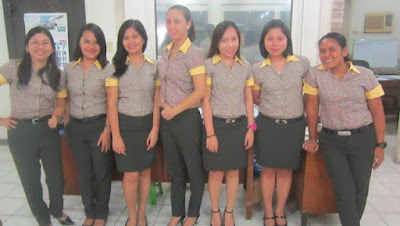 Julie Ann (second from the right) with colleagues in Talisay Rural Bank, Inc.
Julie Ann shared this, "Life had been busier ever since I started working but it is not so new to me since I have been a working student during my college years ... the only difference now, I am working with pay. When I graduated in 2013, I remembered applying to 2 commercial banks where I did not receive any response. A credit firm and manufacturing/delivery company texted me for an interview but I did not pursue them anymore since Talisay Rural Bank, Inc. was the first to respond to my application. I love my work, I am enjoying it. I was an accounting clerk when I first entered the bank and was appointed as Loan clerk this year having new responsibilities. I am loaded with work, especially every board meeting, end of month and end of quarter but I like doing many things or multi-tasking since it is like time is just passing by. Though the compensation is not that high, I still think that working in this kind of institution is my field of work and I am thankful to be in this heartwarming environment where my colleagues are mature, respectful, caring, experienced and kind. This might be my stepping stone as I plan to enter a commercial bank maybe after a year or two." She would not have attained her dream without the help of one person to whom she is very thankful to. She said, "I am grateful to my aunt, not just because I am her niece but I know many people would also think that she is a wonderful, loving, warmhearted, hardworking, caring, God fearing, kind and generous person. She is a selfless person who I adore the most. She supported my studies (from Kindergarten to high school at St. Francis of Assisi School of Silay City thru Tapulanga Foundation) until I graduated college. She did the same with my eldest sister and twin sister. And until now, she still supports the tuition fees and other expenses of our 2nd to the youngest sister and our youngest brother who is currently studying at UP Miagao. I admire her and will always be grateful to her. She helped me become what I am now. Also I would like to thank God for making our aunt an instrument of His Love for us. I believe it is all His plan and I trust Him always. I also thank my parents for bringing me into this world, for nurturing me not just physically but intellectually and spiritually. The same goes to my teachers from kinder to college." Please click on this link to read the article about her in 2007. A Birthday Surprise Celebration for AJ!